Alpine forests will be at great risk should weather phenomena such as droughts and torrential rain become more frequent. As a study by the Technical University of Munich (TUM) shows, the mountain forests of the Bavarian Alps have seen a significant reduction in topsoil organic matter over the past three decades. The study authors’ recommendation is therefore to preserve, or better still, increase soil humus regardless of climate change by implementing humus-promoting forest management to safeguard the mountain forest’s protective function and to mitigate floods. Humus stocks are essential for soil fertility, water balance and nutrient supply of the soil. Previous studies established that especially in cooler mountain regions, carbon bound in soil organic matter reacts very sensitively to warmer weather caused by climate warming, and is increasingly released by microorganisms. As a consequence, the soil loses one of its essential features: its capacity to store carbon, which, after being released, also contributes to global warming. So far, no exact data existed as to the changes in humus stocks of Alpine soil over the years, and any calculations to this effect are rather imprecise. Scientists at the Technical University of Munich have now published a new study in Nature Geoscience that identifies the changes to Alpine humus stocks based on data from 35 mountain forests and mountain pastures. Their study is based on two independent analyses, which permitted conclusions on the changes in soil conditions over the past thirty years. One of the two studies looked at all major forest and soil types across the entire 1,700 square mile area of the Bavarian Alps between 1986 and 2011. The second study observed typical mountain spruce forests in the Berchtesgaden region (total area: 230 square miles) from 1976 onward. “I was surprised to see that the humus stocks of forest soils have seen such a dramatic – and in statistical terms significant – degree of depletion”, says Professor Jörg Prietzel of the Chair of Soil Science at TUM. During the period under investigation, the topsoil organic matter stock of forest soils in the Bavarian Alps declined by an average of approximately 14 percent. The heaviest depletion occurred in soils with limestone or dolomite parent material. They suffered a loss of just under one third of their humus mass. “Overall, the conclusions drawn from the two studies – despite employing different approaches and covering different regions – are almost identical,” explains lead author Prietzel. No silvicultural usage of the areas under investigation took place during the study. Humus depletion must hence be a result of climate change. The soil organic matter decline is highly likely to be a consequence of climate warming, which has been recorded by weather stations in the Bavarian Alps over the past hundred years – in particular in more recent decades. “The Alps in the Berchtesgaden region have been affected quite dramatically,” explains Prof. Prietzel, “as mean air temperature there has seen a particularly drastic rise during summer months.” In connection with increased temperatures during the summer months, regions where air temperatures are on the up also experience a warming of the ground, which presumably is the primary cause for the progressive degradation of soil organic matter. In contrast to forest soils, mountain pasture soils examined in the Berchtesgadener Alps suffered no humus loss in the past 30 years. However, they tend to be without exception less humus-rich than directly adjoining forested soils. The authors of the study suspect that the mountain pastures, which many hundreds of years ago also used to be wooded areas before the advent of alpine farming, must have lost a considerable portion of their original humus stock relatively soon after the forests had been cleared to make room for the pastures. 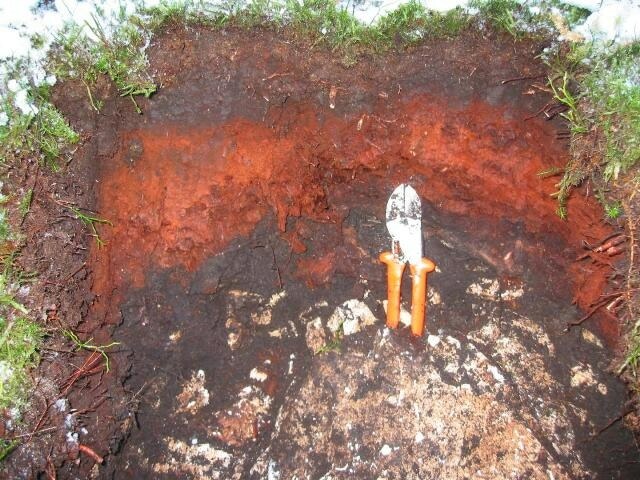 The remaining soil organic matter is not – as is frequently the case with forest soil – mostly present as “forest floor” in the surface layer, but lies deeper underground where it is better protected from humus-degrading microorganisms. Ultimately, the study authors expect average summer temperatures in the Alps to keep rising, coupled with an increase in extreme weather episodes. Hence, we will see more and more extended periods of no rain at all alternating with heavy rain. A thick humus layer with great water storage capability is able to mitigate the effects of such extreme weather on mountain forests and the mountain landscape. It stores water for trees and the Alpine flora, while at the same time reducing floodwaters after heavy downpours. In order to preserve such vital functions of the humus layer, the climate-change-based humus degradation must be proactively countered by promoting humus restoration. Of central importance in this scenario are “resilient” mountain forests that can withstand extreme incidents. Such forests are characterized by being made up of a diverse range of different tree species and trees of varying ages. Trees of such forests yield a continuous supply of stray litter such as leaves, needles, roots or brushwood, and maintain a constant cool “forest climate”, even during hot summers, which in turn slows down humus degradation by soil microorganisms. What’s more, they also prevent erosion-borne humus loss as a result of downpours, snow gliding or avalanches.